Stand in front of one of the Masters’ paintings, perhaps even ‘Nightwatch’ by Rembrandt, and you will soon appreciate the detail in the work. Each brushstroke has created the story for you to see – not only of the central characters but the world that moves and breathes on the canvas around them. Gary Stowe has brought this same skill to his debut novel, painting with his words the characters and world of The Child of Hope, the first of ‘The Masteries’. Each sentence deftly brings to life the experiences of Alain, an unwanted son, as he searches for his kidnapped sister, Annelisse, the one believed to be at the centre of the Child of Hope prophesy. Alain feels a responsibility to find his sister. After all, he is the twin that isn’t wanted whilst the hopes of his kingdom lay with the missing Annelisse. Above all, this book is about this young man’s search, even if what he finds is not what he expects. 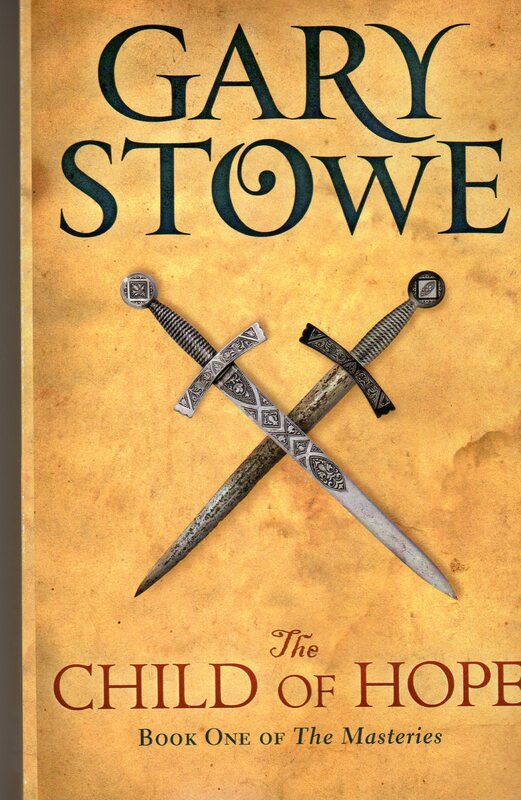 Stowe tells his story through his people and their experiences and emotions, with each moment polished into clarity in fine detail. The voice of the book switches seamlessly between the participants giving depth to the narrative. Nor do the main actors always hold the centre stage. Supporting roles regularly cross the boards, briefly bringing us a view from a new perspective. The language he uses is modern and uncluttered, making the translation of a different world into our own a simple process. Lacking the chunks of laborious paragraphs sometimes dedicated in other books to the creation of a new world, Stowe has allowed the reader to weave their own impressions of this world into the plot. I found this allowed the story-telling to shine more strongly as I wasn’t subjected to long-winded explanations about the physicality of a place. I think ‘somewhere North of here’ gets about as complicated as directions ever get. (Yes, before you argue with me, this sort of detail works in some novels but so often it can become like reading the directions produced by Google Maps). This book has a delightfully bad man in the form of Malkarian, a Master of Earth and Air. I enjoyed disliking him and you will too. He has no qualms about achieving his ambitions, no matter who or what is in his way. And if we mention Makkarian, we should also introduce Ranhald and Merredith, King and Queen, parents of the twins. They have each had the burden of losing a child and each have dealt with it differently. One turns inward and the other outward. One you want to shake and the other you want to cheer on. Holding with the overall simplicity of story-telling in this book, Stowe has limited the palette of characters to a manageable number. No long list of names and descriptions are required to help you keep them all under control. As a result you get to know Stowe’s people more closely, their personalities and motivations, and a stronger connection is built. Stowe has woven in beautiful strands of emotion, shining and dark, that tie characters together. No one is perfect and each has a personal struggle to endure. Relationships are natural and coloured with the complexities of real life, sometimes a difficult achievement when the world is built on fantasy. There are twists in the plot and unexpected events – and when these happen they are often quite satisfying. If there is any criticism it is that the treatment of the prophecy is a little cute in its implementation. Yet, without it, the premise of the book does not hang together and sometimes these contrivances are required to bring a story to life. And, honestly, how often are the decisions in our lives based on misunderstanding and misinterpretation. It is nice knowing that this is just the first book in the series. It is even better to find a unique voice amongst the shelves of modern fantasy. There are hints to what direction Gary Stowe may take the next book but, based on The Child of Hope don’t expect it to arrive where you think it will. Just remember, just because everyone thinks something is correct, it does not mean that it will turn out that way. Dianne Dean is based in North East Victoria. Her first children’s book is currently with a publisher and will be released in early 2013. This entry was posted in Dianne Dean, Dragonfall Press, Gary Stowe, Issue 3, The Child of Hope by Mark Roberts. Bookmark the permalink.